Background: A recent systematic review identified only two prediction models for survival in resectable pancreatic cancer of high methodological quality. One of these two, the Amsterdam prediction model (including differentiation grade, positive lymph node ratio, margin status and adjuvant therapy) had not been validated. 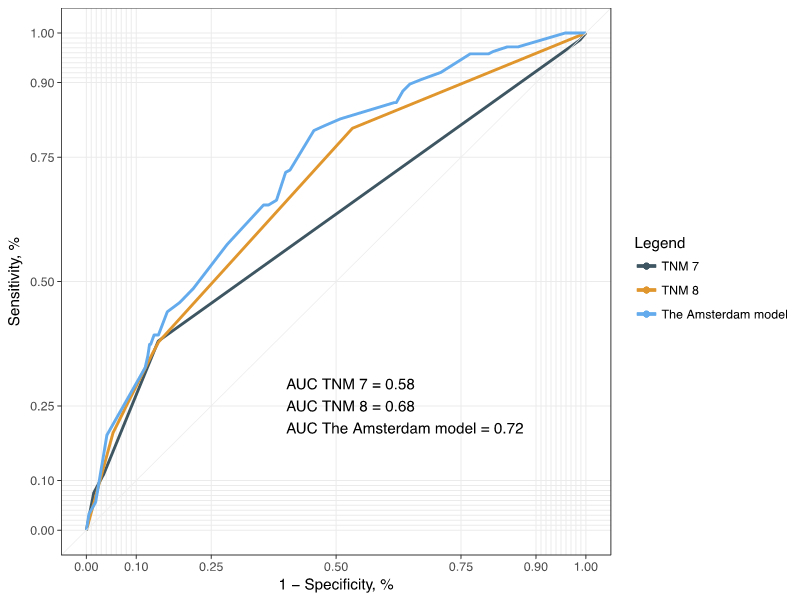 The objective of this study was to validate the Amsterdam prediction model in a large international cohort. Methods: All consecutive patients who underwent pancreatoduodenectomy for pancreatic cancer between 2000-2015 at 9 tertiary hospitals from 6 countries were included for analysis. Calibration and model performance for prediction of 3-year and 5-year survival were evaluated and compared to the 8th edition of the TNM staging system, using Uno's C-statistic, the Receiver Operating Characteristics (ROC) curves and area under the curves (AUC). Validation was performed according to the TRIPOD statement. Results: A total of 1,943 patients were included (mean age 65 years, 52% male), with a median overall survival of 23.6 months. The validation cohort was demographically comparable to the design cohort, but had a higher lymph node yield (median of 19 vs. 8) and more N2 disease (22.0% vs. 40.3%), and a higher use of adjuvant therapy (74.0% vs. 26.0%). Calibration analysis demonstrated that the predictions of 3-year survival did not systematically deviate from the observed survival rates with a slope of 0.85 and an intercept of 0.04. Uno's C-statistic was 0.65 in the validation cohort, compared to 0.67 in the derivation cohort. ROC-curves showed an AUC of 0.70 and 0.72 for 3- and 5-year survival, compared to 0.65 and 0.68 for the TNM 8, respectively. Analysis of model performance among the different countries demonstrated a robust C-statistic, ranging from 0.63 to 0.67. The web-based calculator www.pancreascalculator.com was updated with these data. Conclusions: This international multicenter study validated the previous predictions of the Amsterdam model for 3- and 5-year survival after pancreatoduodenectomy for pancreatic cancer. Model performance was fairly accurate in terms of calibration and discrimination, and the model demonstrated robustness within the different countries. The model incorporates easily available variables (differentiation grade, lymph node ratio, margin status and adjuvant therapy) and the web-based calculator facilitate easy use in daily practice.